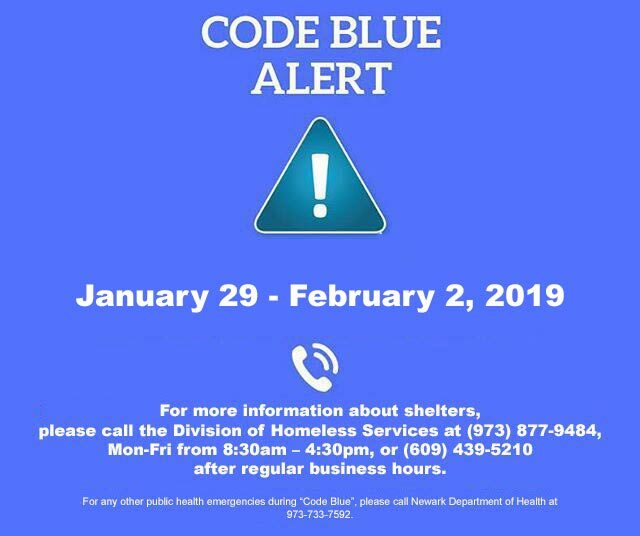 Mayor Ras J. Baraka and Department of Health and Community Wellness Director Dr. Mark Wade is activating “Code Blue” for this week and into the weekend, starting today, Tuesday, January 29, through Saturday, February 2. Code Blue is called when temperatures reach 25°F or lower without precipitation or 32°F or lower with precipitation. “I urge our residents to take precautions to keep their homes safe and be safe when they are out and about, and to check on their neighbors, especially the disabled, children, and the elderly,” said Mayor Baraka. In addition, Mayor Baraka reminded residents of the hazards of cold weather. “Several layers of warm clothing and protection against moisture and wind are important, even though weather may not seem to threaten cold injury. Gloves and socks should be kept as dry as possible. Insulated boots that do not obstruct circulation are essential in very cold weather. Warm head covering is particularly important, since 30 percent of heat loss is from the head,” he said. “We are expected to see some snow showers on Tuesday into Wednesday as well as endure temperatures as low as 3°F with a wind chill of -16°F. Residents should take measures to ensure their safety at home and when outside of their home,” says Director Wade. The City would also like to remind residents that there are a number of homeless shelters operating during the extreme cold weather that have partnered with the City to provide emergency sheltering, including Code Blue sheltering. For more information about sheltering services, contact the shelters listed below or the Division of Social/Homeless Services at (973) 877– 9484, Monday through Friday, 8:30 a.m. to 4:30 p.m. or (609) 439-5210 after regular business hours. For any other public health emergencies during Code Blue, call the Department of Health and Community Wellness on-call service at 973-733-7592. · Keep sidewalks and entrances to your home free of snow and ice. · Watch for ice dams near gutter downspouts. Keep gutters free of leaves and debris so that melting snow and ice can flow freely. Ice dams can cause water to build up and seep into your house. · Keep the house heated to a minimum of 68 degrees. The temperatures inside the walls where the pipes are located is substantially colder than the walls themselves. A temperature lower than 68 degrees will not keep the inside walls from freezing. · Identify the locations for the main water shutoff in your home. Find out how it works in case you have to use it. · Open hot and cold faucets enough to let them drip slowly. Keeping water moving within the pipes will prevent them from freezing. · Check on seniors to make sure that they are warm and dry. · Stay indoors as much as possible. · Check all windows and doors for drafts. Place plastic if you feel a draft. · Do not leave space heaters unattended. · Do not use generators indoors. · It is illegal to use kerosene heaters indoors. · Keep anything that can burn at least three feet away from heating equipment, like the furnace, fireplace, wood stove, or portable space heater. · Have a three-foot “kid-free zone” around open fires and space heaters. · Never use your oven to heat your home. · Remember to turn portable heaters off when leaving the room or going to bed. · Take inventory of emergency items. · Test smoke and carbon monoxide alarms monthly. · Avoid carbon monoxide poisoning by checking and cleaning your furnace and chimney regularly and ensure you have proper ventilation and the exhaust pipe is free of debris. The City of Newark Housing Code requires all property owners to supply heat from October 1 through May 1 between the hours of 6 a.m. and 11 p.m. at a minimum inside temperature of 68°F, and between the hours of 11 p.m. and 6 a.m. at a minimum inside temperature of 65°F. To report no heat or hot water in your apartment, call the Division of Code Enforcement at (973) 733-6471. Anyone with questions about the City’s heat ordinance or any other Newark municipal policy or program can contact the Newark Non-Emergency Call Center at (973) 733-4311, from 8:00 a.m. to 5:00 p.m., Monday through Friday.